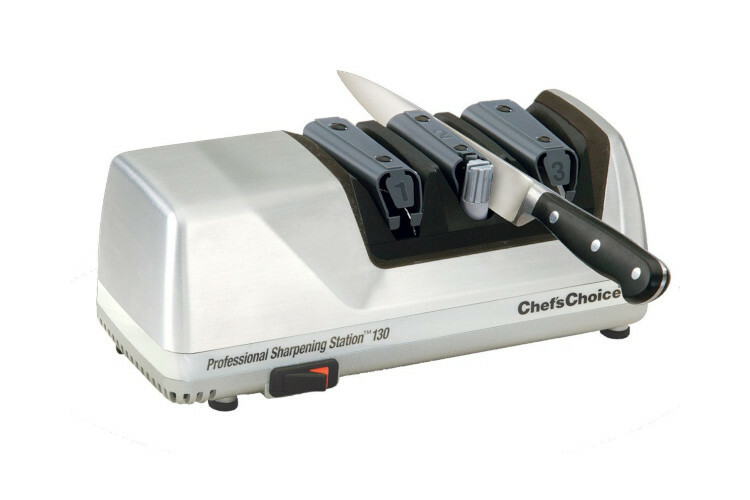 The Chef'sChoice Professional Sharpening Station in brushed metal, is a great tool to have for creating either a sharp, fine edge or a steeled edge that has bite. It's perfect for sharpening any European-style kitchen knife or sporting knife. The first stage in this sharpener from Chef'sChoice uses a diamond wheel for sharpening the hardest steel blades. The second stage simulates a honing steel and can create an edge with bite, for cutting fibrous foods. The third stage is a stropping and finishing wheel that's also great on serrated knives. This sharpener from Chefs Choice can put a perfect 20 degree edge on any knife.